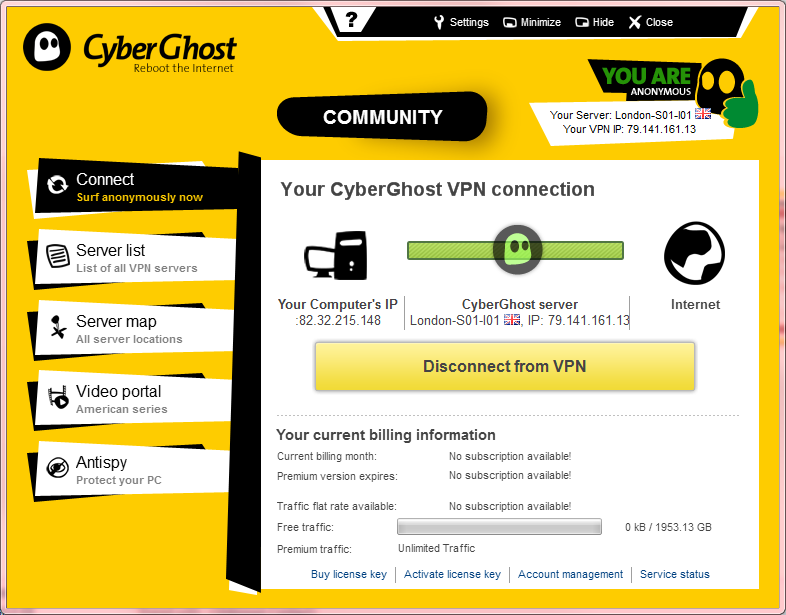 The most interesting thing is that they actually offer a free VPN service.Cyberghost is a Romanian VPN company with German connections. Even if the country is under the European Data Retention laws, there’s little efficiency in their governmental system. 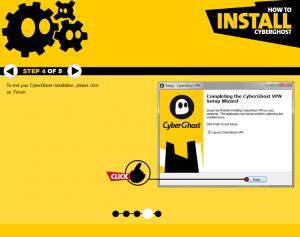 The company claims that there are no log files with clients’ activities over the internet. The first signs were encouraging so we were anxious to check Cyberghost in depth. There are three different plans to choose from. As we already said, the first one is free. In FAQs section the company says that the main goal is to provide free VPN service to the public and the other two plans are just a way of helping the funding process. 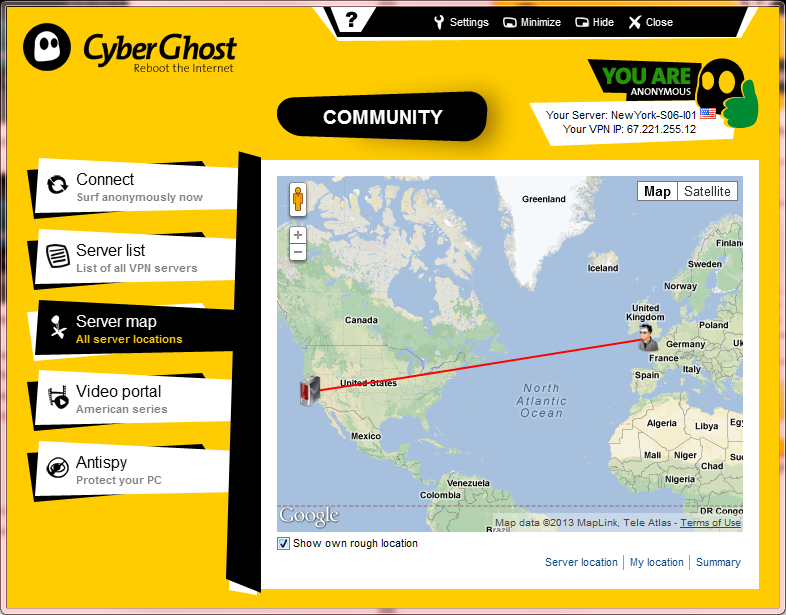 There’s really cool that you can actually take advantage of a VPN service for free. 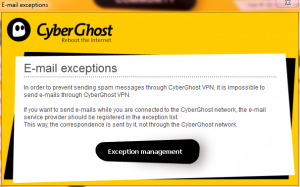 However, Cyberghost set some real limitations to the features available. After 6 hours of continuous use, the connection will be automatically stopped. There is no such thing as automatic reconnection. Doesn’t offer the possibility of choosing a server. You don’t have to pay anything to connect; remember that they use 128bit OpenVPN encryption for this plan. In case of connection issues, the reconnection will be automatic. No advertisements and no auto disconnection. It still uses 128bit encryption for OpenVPN, but you can also go for PPTP and L2PT/IPsec – still 128bit encryption. There’s OpenVPN 256bit encryption method used at some servers found in an extended area. You can ask your questions using their live chat support, or by a ticket system. The live chat support is faster, but there’s no guarantee that an operator will be there 24 hours a day. You can also check out the FAQs area or the bulletin board. You can mostly have any question answered by one of these methods. 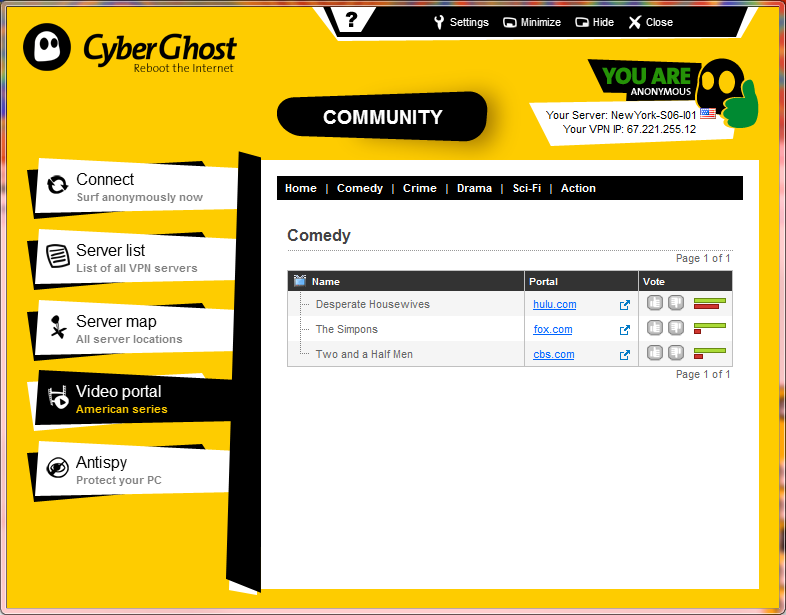 In terms of website things are looking really good. All the information is easy to find. There’s even a blog and several details about the company, including Facebook and Twitter pages. It’s quite professional and we were impressed. 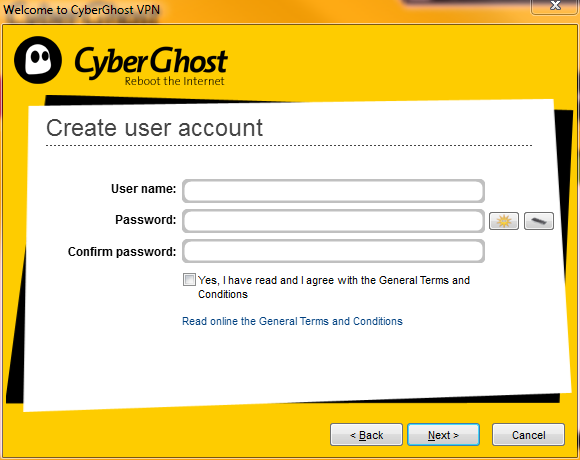 The free web proxy allows users to access the internet anonymously even if the Cyberghost software is not installed. We will talk a bit later about this cool feature. The 128bit encryption method offered in two packages is probably more than enough for you, but, as you know, we would rather stick to the 256bit encryption. 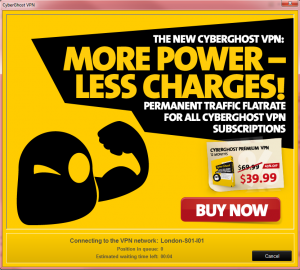 It’s available on the last package so you need to pay more if you want to surf the net without any issue. In terms of log files, thing are perfect. They don’t record your activity on the internet at all. 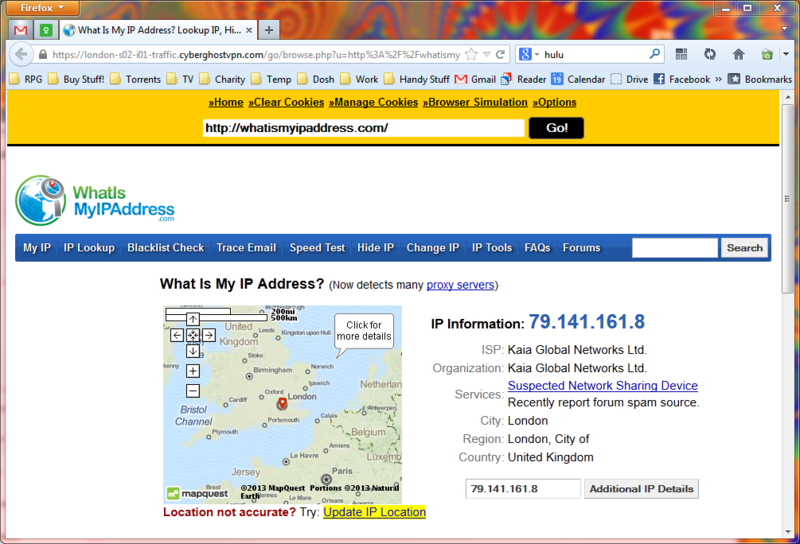 Not even the IP addresses. They just keep some files for statistics, but in 24 hours they are history. Another cool thing is that the company doesn’t want to keep any of your private data, so as soon as you pay, they delete all the stored details. There were rumors that German authorities demanded some user information, but due to their policy, they had nothing to hand over. A passed test. There is no need to insert personal information at the registration. A cool thing was that we were assisted by a Flash guide during the installation, even if it was easy anyway. Next, we had a great surprise. The biggest free trial we ever encountered. 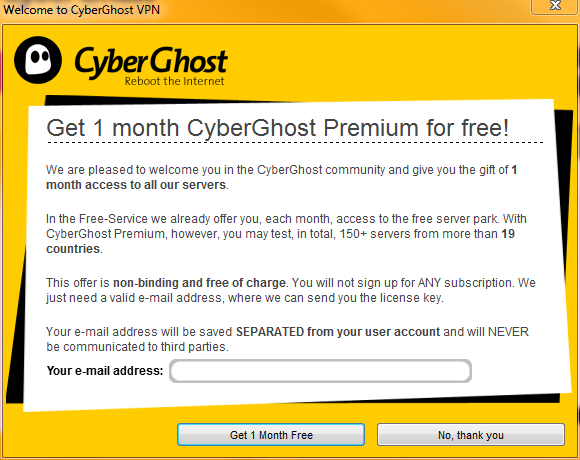 They offered a free one month trial CyberGhost Premium package. We never encountered anything like that, so we were very pleased. After we logged on there was an advertisement for the Premium services. There were also more, small adverts which popped up occasionally, but they were not as annoying as we expected. You can close the adverts in just a few seconds. Due to the fact that the cost was zero, we considered this to be a really small price to pay. We were really happy to see that the client was very professional made and looked exactly like the website. If you choose the free user plan you can only press a single button, without choosing the server. As you first launch the client, you’ll get a warning. 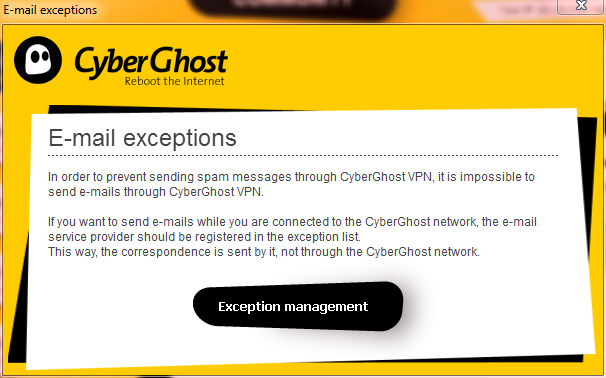 It says that e-mail messages can’t be sent in the same time with the anti-spam measure. On the other hand, there is a feature that allows you to set up exceptions, so that should solve the problem. 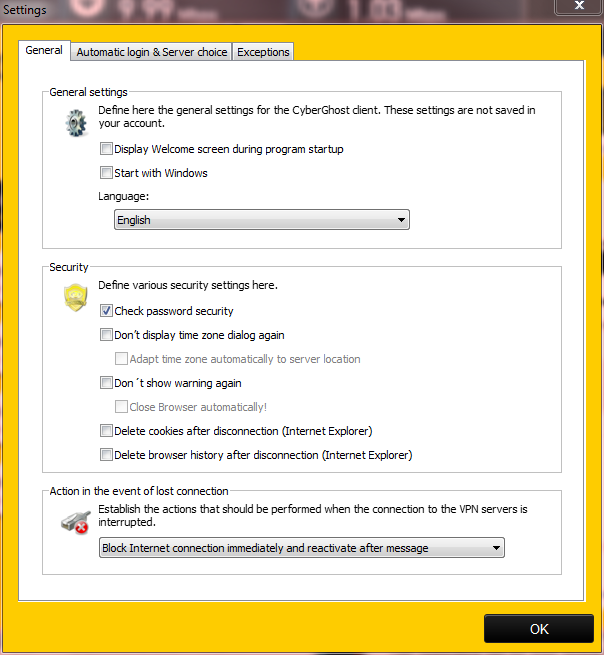 In the settings tab there are a variety of things that let you customize the way that software works. We performed a test using the 10MB UK broadband. Below you can see the results. 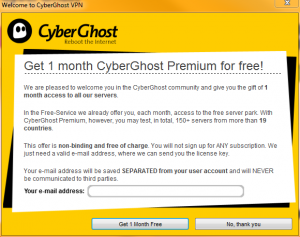 Please note that we used the free service, so there was no possibility of choosing a server. Each time a user logs in, the client automatically assigns a server. There is the possibility of obtaining different results. 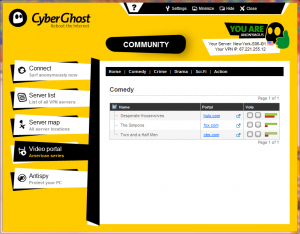 Judging by the fact that we were able to surf the net in anonymity, for free, we were more than pleased with the results. After we took the advantage of the free trial, it was time to see what it was all about. No difference when it comes to client, but there’s the possibility of choosing a server. There’s even a cool filter in the top side. 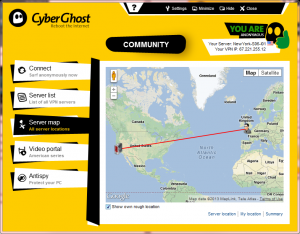 There is even a small map which displays information about your real and false location. There is a Video Portal in which you are provided link to a limited number of popular TV series. We would say that it’s not a necessary trick, but at least it’s not standing in the way of the other features. Same connection, another test, another package. There are config files + instructions found on the website for iOS, Android, Linux and OSX, using OpenVPN. We noted that on Android we required a rooted device, so we didn’t perform any tests. We were unable to find instructions on configuring Android, Linux, OSX and iOS with PPTP protocol. While we were checking the tutorials we noted that there were plenty of instructions but no screenshots attached, so this might be a little improved. As we promised, we came back to this topic. We could see that it’s not really complex since we didn’t manage to get Youtube running, but it still provides a good way of surfing in anonymity. 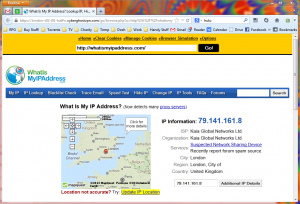 Even if the country was real, the IP and the city were not, so free web proxy scored high. 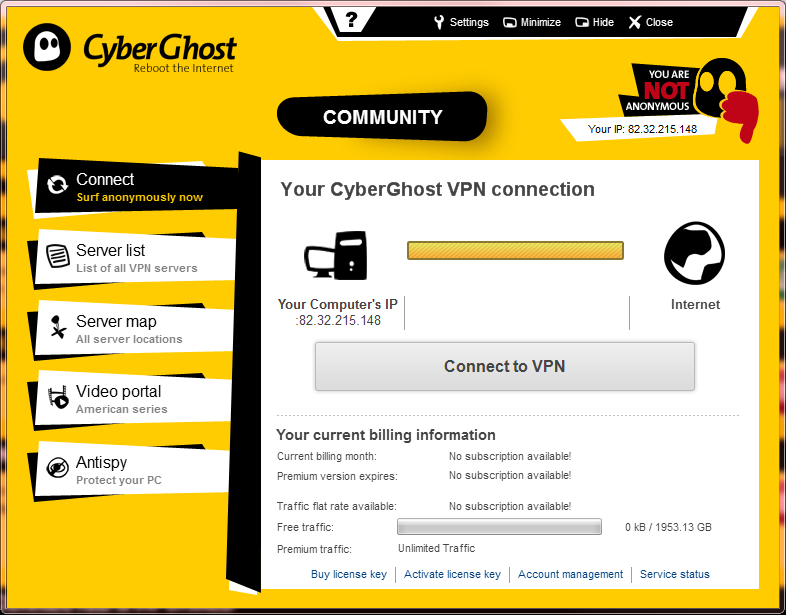 However, the free VPN offered by CyberGhost made us wonder why would anyone possibly need web proxy service. The possibility of choosing a free plan. 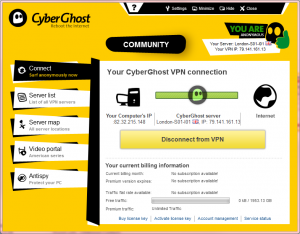 We rarely see a free VPN service. No servers outside US and Europe. In conclusion we have to say that we tried to find some weak spots in this company’s services, but we hardly found some. They offer great connection speed for the paid packages, as well as good for the non-paid ones. Even if they give 256bit encryption only to premium plus users, we still think the things are well balanced. Due to the fact that they offer a lot for free, it’s understandable to demand more money for top services. And there’s the 1 month free trial which we loved. There’s a potential problem because servers are located only in Europe and America. Other users will suffer from speed problems, but we hope that they will add more servers to the list soon. Apart from this detail we reckon that the CyberGhost got all what it takes to be one of the best VPN providers on the planet.